Chanoyu is about awakening our hearts to the deeper themes of our lives. Let's. The morning of the 5th of February is the Lunar New Year for 2019. Candlelight turns to sunlight. As the sun rises, we will prepare tea, alone, each to ourselves in our private abode. But we will be together in spirit. I openly invite all people to prepare a personal bowl of tea at dawn for the Lunar New Year - 'one dawn, together'. Tea can be matcha, bowl tea oolong, jakseol green, yerba matê, whatever your elixir. Temae, darye, chadao, gongfu, whatever your beat. From total hack to grand master, your technical ability doesn't matter. All that matters is our shared spirit. If you're keen to share the spirit, please share a photo of your chanoyu on social media using the hashtag #onedawntogether. 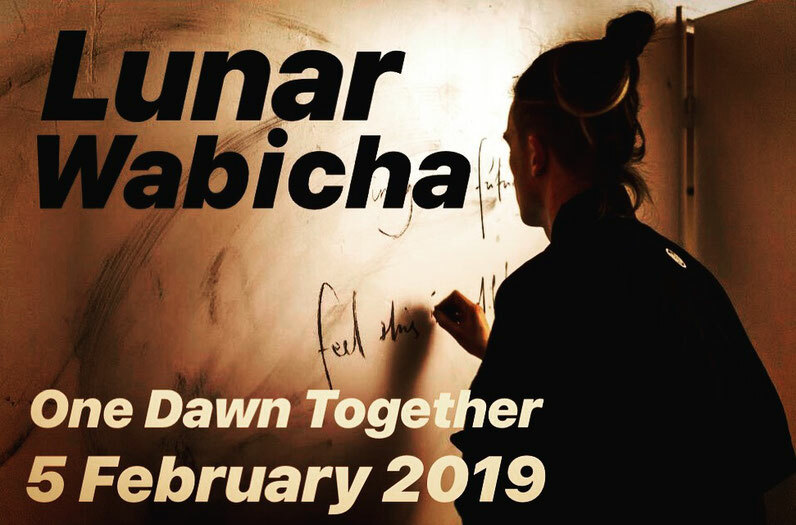 The idea for Lunar Wabicha: 'One Dawn Together' was sparked from one of the tea records attributed to Rikyu. A translation and commentary of this tea record is below for those interested. Please make yourself a tea on the morning of the 5th of February. I'll be with you in action and spirit. Please download and read the pdf file for the additional information in the footnotes of the text. As a personal account of how Rikyu marked the New Year with tea, this tea record is extremely valuable for our understanding of the spiritual side of Rikyu’s chanoyu. In being a personal account, this record is actually one of the entries in the Nampō Roku that lends evidence to the theory that the Nampō Roku was fabricated - why would Rikyu give a record of his personal chanoyu to someone? But whether this chanoyu happened in actuality or not is beside the point. There's no arguing Rikyu's spiritual depth, he was certainly apt to conduct such a start to the New Year. We can easily imagine Rikyu creating this personal ritual that embodies a high spiritual ideal of chanoyu. We can glean timeless lessons from this tea record, and this is the real treasure. In the Nampō Roku, the entry that follows this New Year’s kaiki is dated the first day of the rat (ne no hi), 5th day of New Year. The first day of the rat fell on the 5th day of the year in 1582. From this we can infer that this chanoyu was on New Year’s morning of 1582 (24th January for the Gregorian calendar). As the mizusashi is decorated with a shime-nawa, this chanoyu was more than likely conducted at dawn using the first water of the New Year. This water is called ‘waka-mizu’ with ‘waka’ meaning ‘egoless, awakened to one’s divine heart’. ‘Mizu’ means ‘water’. The time for drawing the first water of the day for chanoyu is at or just prior to daybreak, when the water is charged with the special vitality of yin (night) shifting to yang (day). Rikyu would have likely aimed to perform his first chanoyu of the year together with the first sunrise. He would need to prepare in advance and the earliest time for this is during the time of the tiger, between 3am and 5am. The time of the tiger is yang, the time when the qi of the land changes to the new day. Daybreak falls in the time of the rabbit, between 5am and 7am. Rikyu may have fetched water in the very tsurube he used in this chanoyu during either of these times. After decorating the hinoki water pail with shime-nawa and placing it in the chashitsu, he would have commenced his chanoyu around daybreak. We can see he performed ‘ōbukucha’. This is a type of tea prepared with waka-mizu where auspicious foods like ume-boshi, sweet black beans, sanshō pepper and kombu are added to the tea before drinking. What Rikyu included in his ōbukucha is anyone’s guess. We may imagine Rikyu preparing ōbukucha and dedicating the tea to the Buddha. After the dedication, Rikyu would have imbibed his elixir in the dawn of the New Year. This tea record can become a template upon which to base our own New Year’s tea ritual, pursuing the spiritual depth glowing from this simple entry. In Japan, Mokkei is considered one of the greatest zen ink painters in history. He paints an intimate, ‘worts and all’ view of zen thought. The image hanging in Rikyu’s alcove is of Jurōjin, one of the Seven Gods of Fortune or Shichi-fukujin, according to Daoist beliefs. Jurōjin is the God of longevity and is often depicted with a long white beard and carrying a staff. Jurōjin originated from the Daoist god, the Old Man of the South Pole, who is the deification of Canopus, the brightest star of the constellation Carina and the second brightest star in the night sky. There is also a possibility that the description of ‘jurōjin’ is being used as a general term for either ‘Arhat’, ‘Immortal’ or ‘Old Sage’. By selecting such an image to focus on for his New Year’s cha, we can see Rikyu reaffirming his ultimate goal of spiritual awakening through chanoyu. By marking the New Year with a personal affirmation, we can see a little of Rikyu in ourselves. We can relate to this very human side of Rikyu and be follow his lead towards our own spiritual awakening through chanoyu. According to the Nampō Roku, Rikyu borrowed a picture of the unryū (dragon in the clouds) motif from a celadon porcelain mizusashi from Jōō. Rikyu then copied the motif and had a blacksmith make the distinctive unryū kettle form with the dragon in the clouds motif wrapping around the body of the kettle. Another common tradition is that Rikyu simply received his unryūgama from Takeno Jōō. An unryū kettle is suspended from the ceiling with a chain or wooden ‘jizai’ when used over a hearth. The beauty of this kettle is not just in its elegant form and motif. The kama is smaller than usual and boils water very quickly. It is therefore ideal for when one has unexpected guests and when preparing tea for oneself, as one does not have to wait long for the water to boil. There is no mention of a sweet or meal on this tea record. One is tempted to imagine Rikyu laying fresh charcoal, preparing the mizuya, putting tea in the chaire, and meditating until he started to hear whispers from kettle. A ‘tsurube’ mizusashi is a square, plain wood bucket originally used for fetching well water. The vessel has a wooden handle running vertical across the mouth, with two slats either side used as lids. Jōō first adopted the bucket for use in the mizuya. Then Rikyu took the idea a step further by using the tsurube in the tea room as a mizusashi. As such, the tsurube became a classic example of a ‘mitate’ that embodies the wabi aesthetic. The look of the tsurube has proven timeless, as it remains a hugely popular piece among tea people today (myself included). However, nowadays they are supposedly made to ‘Rikyu’s specifications’, with the tsurube with the straightest and clearest wood grain fetching high prices. As such, the tsurube has become the ghost of wabi. Shime-nawa or ‘enclosing rope’ is made from rice straw or hemp and used for ritual purification in the Shinto religion. Shime-nawa is often festooned with ‘shide' paper that resembles lightning to ward off impurities. A space bound by shime-nawa indicates a sacred or pure space. Shime-nawa are fastened around things thought to be inhabited by spirits, and things capable of attracting spirits. It is not clear whether Rikyu fastened the shide to the shime-nawa, but this is indeed the case in the practice of many schools today, and simply looks cool. The tsurube contained water drawn at the time when the qi of the land changed to the New Year. At this time, water is charged with an especially auspicious energy, linked to the creative source itself. This ‘waka-mizu’ imbued with the power (symbolic or real) to awaken one’s divine heart, is treated as sacred by Rikyu. This chaire is likely the same one that Rikyu would later decide to use at the Kitano Grand Tea Event, held at Kitano Tenmangu Shirine in 1587. After Rikyu’s death the chaire found its way to the second generation Tokugawa Shogun, Tokugawa Hidetada. After the Battle of Sekigahara in 1615, Hidetada gifted this chaire to Hosokawa Sansai for his military feats during the war. The chaire has three shifuku, all made from rather simple fabrics that appear to be imported from India. In Rikyu’s tea records, we see him using this Yakushi-dō tenmoku in 13 of his recorded gatherings, making it one of his most often used chawans. ‘Emperor Murakami (926-967) was a devout worshipper of the Buddhist Goddess of Mercy (Rokuhara Kanzeon). At the time of serious illness, the Goddess appeared to the sick Emperor in a dream and directed him to drink a special tea to heal his illness. Emperor Murakami followed the Goddess’ message and he soon made a complete recovery. After this happening, shrines and temples began conducting a ceremony at New Year’s time of drinking ōbukucha tea for a year’s perfect health. This tradition continues today. Ōbukucha was originally written 王服茶, meaning ‘the tea the Emperor drinks’, representing the fact that it was originally the Emperor’s tonic. Over time, the original characters were exchanged with more auspicious characters with the same pronunciation 大福茶 (tea of great fortune). Another variation of the origin of ōbukucha says that there was a plague epidemic during the time of Emperor Murakami. In response to this, itinerant Pure Land Buddhist priest Kūya Shōnin (903-972) is said to have dedicated tea to the Buddha before distributing the tea to common folk. This tea was called ōbukucha (御仏供茶) where Buddha = ‘bu’, dedicate = ‘ku’, tea = ‘cha’, and ‘o’ is an honorific prefix. By drinking this tea first offered to the Buddha, many people made a full recovery from their illness. Since this time, it became a New Year’s tradition to prepare and drink ōbukucha to ward off sickness. We may imagine Rikyu preparing ōbukucha and dedicating the tea to the Buddha. After the dedication, Rikyu would have imbibed his elixir in the dawn of the New Year. A tsurukubi ‘crane’s neck’ flower vase is a classic shape, but nothing too original. Perhaps Rikyu selected the vase for its auspicious associations. The crane has been a symbol of longevity since ancient times. It is said to be a bird that dwells in the pure land of the immortals and the appearance of a crane is considered a good omen. The ume flower is the first flower to blossom after the peak of winter. Enduring the still frigid cold, the ume blooms with a strong, mesmerising perfume, as if announcing the oncoming of spring to the world. For these reasons, the ume is a symbol of joy and new awakening. Kamiya Sōtan (1553-1635) notes in his diary that Rikyu first started using a hollowed-out gourd as a sumi-tori (charcoal basket). The sumi-tori being used on this occasion is a ‘te-fukube’ which means it had a handle (te). The handle would have been a strip of the shell left joined to the body, running across the top of the mouth of the sumi-tori.